Microbiology and environmental toxicology graduate student Kingsley Odigie is investigating the impacts of wildfires on the release and transport of contaminants in the environment. On a warm afternoon in May 2009, fire erupted in the mountains above Santa Barbara. The flames burned 8,733 acres and destroyed 80 homes. But UC Santa Cruz graduate student Kingsley Odigie, who had come to the U.S. from Nigeria with dreams of becoming a scientist, discovered another consequence of the blaze. It released noxious lead into the environment. Years of leaded gasoline use and exhaust-spewing cars had released lead that was then sequestered by plants and soil in the area. But what Odigie discovered — along with UCSC Professor of Microbiology and Environmental Toxicology Russ Flegal — was that the metal, which can cause neurological problems in both children and adults, was remobilized when the vegetation burned. Flame reawakened the toxic beast. For Odigie, the finding was the result not only of six years of research but also of his fierce determination to overcome the hardships he faced. 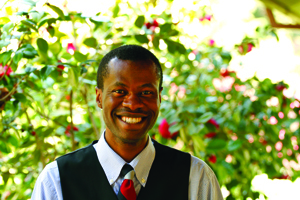 On June 13 at 4 p.m. at UCSC's East Field, Odigie will mark that accomplishment when he receives his doctorate in environmental toxicology. Odigie arrived in the U.S. in 2002 without knowing a single person. He had grown up in a humble apartment in Benin City in southern Nigeria, having never stepped beyond the boundaries of his country. His mother was a businesswoman and his father, an elementary school teacher, had died when Odigie was young. But Odigie remembered the long talks he had with his dad about science and about the importance of education. "During that time, my father didn't have too much opportunity," Odigie explained. "He wanted to encourage us (his children) to get an education because he was not able to do it." Alone and without family, Odigie blended into the students at San Jose State University. But what set him apart was that, in addition to his classes, Odigie sometimes worked up to 60 hours a week to support his studies. He held down a full-time night job and a part-time day job. Still, he managed to earn a double major in microbiology and forensic science with a minor in chemistry. His grades were so good, he was accepted into the Ph.D. program at UC Santa Cruz. It was at the wooded campus, Odigie said, that he discovered his love of research. "It allows me to be inquisitive," Odigie said of scientific study. "It's like: Here is a problem and, OK, let's solve it. It makes me feel like I am helping the human race advance knowledge." Odigie spent hours collecting and analyzing samples that led to his discoveries. "I know that when I call our lab in the middle of the night, the odds are he (Odigie) would answer the phone," said Flegal, who described Odigie as having "an exceptional work ethic." Odigie's findings, published in the journal Environmental Science and Technology, have broad implications for the future as climate change increases the frequency and intensity of wildfires. "As Kingsley has shown, those fires remobilize lead and associated pollutants that have been sequestered in forests, adding to the current levels of those pollutants in the atmosphere where they may be inhaled by humans and other organisms," Flegal said. Flegal also noted that Odigie found time to mentor undergraduates and work with visiting scientists while he was at UCSC. Odigie offers a wide smile. "As they say, science is not complete until it is shared," he said. Sitting in a fourth-floor meeting room in UCSC's Physical Sciences building, Odigie said he plans to pursue post-doctoral research, then go into teaching and research where he can help expand and spread knowledge — just as his father would have dreamed.